Gabe Garms is passionate about permaculture, ethnobotany, bird language, and wilderness survival skills. He wrote several articles while teaching at Alderleaf. 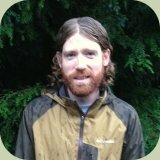 He is a graduate of the Wilderness Certification Program, holds a Permaculture Design Certificate and a Cybertracker Tracking Certification. Before Alderleaf, he obtained a Bachelor’s Degree in both Marketing and Information Systems from Marquette University in Milwaukee, Wisconsin. He is originally from Chicago and spends his free time birding, gardening, playing music and constantly improving his survival skill set.